Jo Ann Smith – Prepare to be transfixed by the ethereal sounds of a sweetly tuned diatonic autoharp in the hands of a true master. Performing live and in studio, Jo Ann Smith proves beyond doubt that the parlor instrument of old is capable of incredibly beautiful music. In her experienced hands, the autoharp becomes a vehicle for emotion and musical expression that has charmed audiences and earned her legions of followers world-wide. Her YouTube videos featuring autoharp have a combined viewership of nearly 1 million views to date. Jo Ann performs regularly, both as a solo instrumentalist and as a lead member of local acoustic bands. Jo Ann is a passionate promoter of the autoharp, and uses her skills not only to enlighten but also to teach others about the untapped potential of this unique instrument. 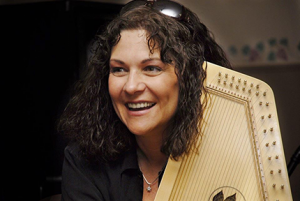 Jo Ann is a two-time International (Winfield) Autoharp Champion, having won the title in 1999 and 2013. She also holds the 2003 Mountain Laurel Autoharp Championship title. She has performed on the WoodSongs Old-Time Radio Hour in Lexington, KY and the Walnut Valley Festival in Winfield, KS. Her CD, Lyrical, released in June 2011, is an instrumental collection featuring diatonic autoharp with mandolin, guitar, violin, cello, bass, Uilleann pipes and more. Her CD, Rhythm of the Rain, was released in June 2004 and is a collection of 15 traditional tunes and songs featuring autoharp, guitar, mandolin and bass. The first cut from this album, Amazing Grace, was included in volume 20 of the Acoustic Rainbow Radio Sampler and is receiving airplay both in the US and abroad. Rhythm of the Rain was also listed as one of the top 70 albums for the month of February, 2005 on the FolkDJ-L website. Carey Dubbert has been playing music for 66 years. Though best known for autoharp and hammered dulcimer, his other instruments have included the piano, orchestral percussion, and bassoon. He has been a featured performer and workshop leader at the California Autoharp Gathering, the Mountain Laurel Autoharp Gathering, the Willamette Valley Autoharp Gathering, the Sonoma County Folk Festival, the Occidental Center for the Arts, and the San Francisco Free Folk Festival, as well as assisting with the Northern California Autoharp Study Group. He has won the Mountain Laurel Autoharp Gathering contest and the National Hammered Dulcimer Championships in Winfield, Kansas. Noted for his relaxed and comfortable teaching style, playing tunes is always an important part of his workshops. Participants are encouraged to achieve the sound they desire by finding techniques that work best for them. Having grown up in Rochester, Minnesota and then graduated from the University of Minnesota, it was a quite an adventure to do graduate studies at the Manhattan School of Music. While in New York City, he played bassoon with the New York City Symphony and a big band called “The New York Brass”. “Thanks Dad” was Carey’s first recording featuring his hammered dulcimer. Next came “One Of Mine”, a wonderfully relaxing mixture of hammered dulcimer and autoharp. On his most recent CD, “Being Home”, Carey plays autoharp and hammered dulcimer. Carey was honored to be chosen to be included on both “The Autoharp Legacy” CD and “Autoharp: Up Close and Personal” DVD. Occidental, California, has been home to Carey and his wife for about 35 years. They have two fine cats and a varying number of chickens. Ellindale is known for her fiber arts and quilting. Ray Choi was born in Chuang Ju in South Korea in 1959. When he was a teenager he taught himself to yodel and went on to start a yodeling club and began a yodeling and singing career, winning a national competition in Korea. He found he had a natural ability for music, theory and perfect pitch, and soon taught himself guitar. In 1968 he heard his first chromaharp, and was so impressed by its sound that a few years later he got his first autoharp, teaching himself strums, finger and thumb picking. In 1984 he followed Jane to California, where they later married, and had two children, David and Esther. Together Ray and Jane own and operate Grace Music in Tustin. After collaborating with mentor Paul Cramm, a luthier in Orange County, Ray also became a luthier, building beautiful, rich resonating tones with full volume into the warm and exotic woods of his own autoharps. Currently Ray has built over 650 autoharps, each taking about 100 hours to craft. Through the years Ray has given lessons to as many as 600 students. Ray is also Music Director of his church, performing at many other churches and public events, including weddings, funerals and celebrations. Ray conducts autoharp workshops and concerts and currently has two local autoharp groups that he meets with monthly. In his spare time Ray is compiling three new books for autoharpists: one of approximately 650 hymns, and another of approximately 1000 popular, folk, religious, western and classical songs, all in authoharp tabluature, a booklet illustrating his finger techniques, and a book/DVD for beginning autoharpists to be published in early 2018. Although Ray plays woodwind instruments, mandolin, and guitar, he lives and breathes the autoharp. “I think autoharp all the time, all day, when I wake up and when I try to sleep,” he passionately states. Over the years he has developed a new technique, dubbed “the hummingbird tremolo” because of its incredibly fast flutter of fingers across the strings, similar to the sound of a mandolin, a skill that took 1000’s of hours to perfect. 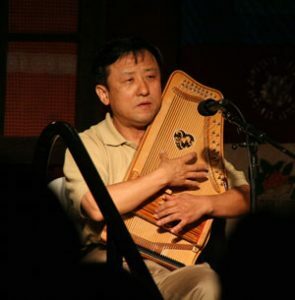 In 2011,using this new skill, Ray Choi won both first place championships at both the Mountain Laurel Autoharp Gathering and the Walnut Valley International Music Festival in the same year, a feat only a few other autoharpists have ever accomplished. 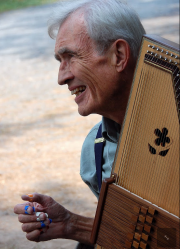 In 2017, he again won the Mountain Laurel Autoharp Championship..
Ray has sold 1000’s of Oscar Schmidt autoharp through the years and the company calls him “Mr. Autoharp.” His passion for the autoharp resonates not only through his own handcrafted instruments, but also through the intensity of his skill, passion and dedication to his students and the autoharp community as he teaches, sings, yodels, and plays the songs we’ve all come to love. Ray truly lives and breathes the autoharp! Ray’s instruction will teach you efficient ways to add musicality to your songs. His performance will demonstrate many techniques, some achieved by only Ray Choi! Neal and Coleen Walters live in Greencastle, PA but grew up in Southern California. Singing and playing since the ‘60’s, their music has been influenced by many different artists and styles of music. 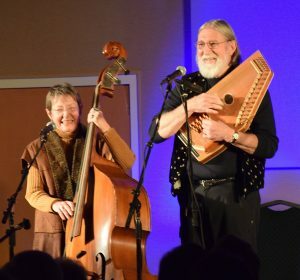 Their current repertoire includes songs from the 1700’s through Gordon Lightfoot, Doc Watson, the Carter Family,’40’s standards and even a couple of Beatles songs. Autoharp, dulcimer and banjo are Neal’s instruments of choice and Coleen adds bass to the mix. You’ll hear lots of harmony singing as well as some instrumentals. Along with John and Heidi Cerrigione, they perform as Doofus and, over the last ten years, have recorded four albums. Neal was a member of the Mill Run Dulcimer Band for over 20 years and recorded nine albums with them. He also edited Music Hound Folk: the Essential Album Guide to Folk Music, published by Visible Ink Press. In addition to their concert appearances, Neal has taught dulcimer, autoharp, banjo and guitar for nearly thirty years in and around Washington, DC and at camps and festivals like Boone, Augusta, Kentucky Music Week, Winterfest, Summerfest, Black Swamp, Autumn Hills, Autumn Acoustics, John C. Campbell Folk School, Tolland Arts Center, Sand Lake Art Center, Cranberry, String-A-Long, Housatonic, Dulcimer Daze, Swannanoa and Old Songs. An evening spent with them in concert will take you to lots of different places. Neal and Coleen have three duet albums, Snowbirds, My Pathway Leads to Pennsylvania, and Old Friends. When not traveling and making music, Neal and Coleen run Basement Studios, providing high quality studio recording and engineering in a rural and relaxed environment with beds and meals Included as part of the package. Other services include graphic design, WEB page design, acoustic music for all occasions, CDs from your old LPs or cassettes, and private and group lessons for dulcimer, autoharp, guitar, banjo and bass. In their spare time, they are on the board of the Mountain Laurel Autoharp Gathering.